Online: Search our FAQs or submit a question if it hasn't been asked! 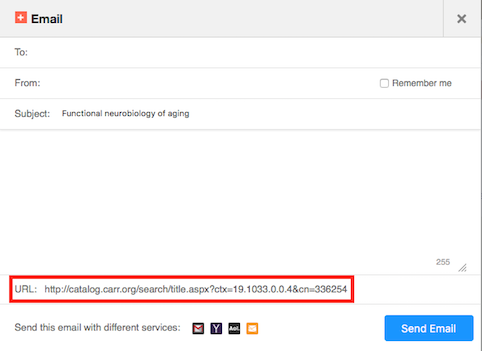 Direct or deep links can be made to single records or groups of records in Polaris. These links can be system-wide (i.e. 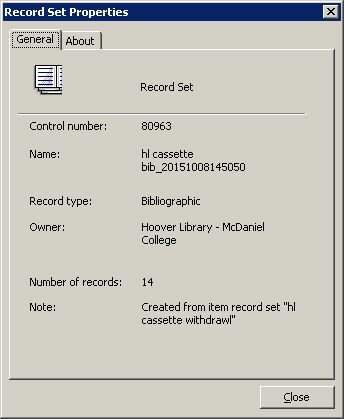 covering Carroll Community College and Carroll Public Library as well as McDaniel), or, more commonly, limited to Hoover Library materials only. The link can also be put into the URL box for the title (just this part: https://catalog.carr.org/search/searchresults.aspx?ctx=19.1033.0.0.4&type=Keyword&by=ISBN&term=9780123518309) - either way will work. The types of deep links and their possible construction is detailed below. Note that for all of these, there may be multiple ways to construct a link that does the same thing using differing syntaxes. You can find a permalink for an individual item in the catalog from the full record of the item. When you find the item you want to link to, click on the title to bring up the full record. In the box to the right of the record, click on the email icon to bring up a new window. Copy the URL from the bottom of the new window to paste into your application. Right click on this link and choose "Copy link address". That way, a user will go directly to the resource rather than having the extra step of going through the catalog. You will want to verify that the item still exists before each term, however. As noted in the ebooks linking page, library subscriptions to electronic items are not always permanent. 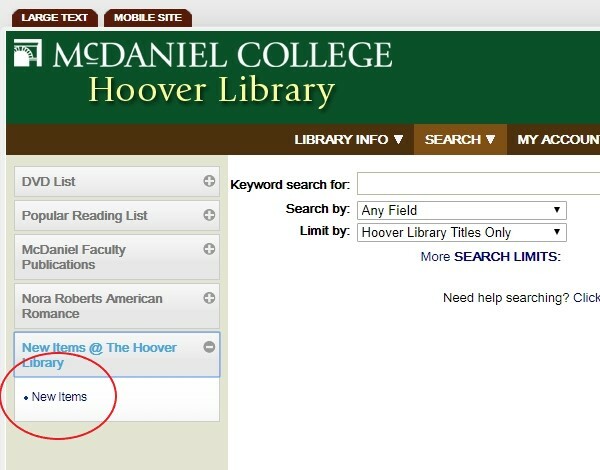 Boolean links are often necessary to limit retrieval to only Hoover Library titles (if that is desired). For each type of search, at least one Boolean example is given (as indicated by the &type=Boolean in the URL). Others can be constructed as deeply nested as logic will permit - some experimentation will likely be necessary for complex sets. Why is my permalink not working? There can be a number of reasons that a link does not work. The most common one is that the search is not "encoded" - this means that spaces or diacritical marks such as apostrophes cannot be interpreted by the web browser when the URL is clicked. More information on this encoding can be found here: http://www.blooberry.com/indexdot/html/topics/urlencoding.htm This is most likely to occur in title and subject searches with multiple terms separated by spaces. URL Tools Add-In for Excel - this addon for Excel provides functions for encoding and decoding text for construction of URLs. NOTE in the above example that the Boolean stop word "and" in the title necessitates enclosing the entire title in quotes and searching it as a phrase - this applies to any search using a stop word. This search can only be done via Boolean, and does not need a location limiter, as collection codes are specific to each library. The default sort (RELEVANCE) can be changed as needed. Some collections (i.e. eBooks) are quite large, and exceed the 5000 title limit that shows in the PAC, so a direct link to those collections is not very useful. The smaller, more specialized collections, however, can benefit from a direct link. The advantage to this method of linking is that they run a new search each time the link is clicked, thus the result list is always up-to-date, as opposed to one that is produced by a record set link (below), which is static. You can combine Author, Title, and/or Subject parameters in the same query. Note the presence of the "*" after the call number - this picks up everything after the last digit specified, so searches can be as precise as you need them to be (i.e. if you only want 616.23* not 616.22* or 616.24*) AB=19 limits to Hoover items only. 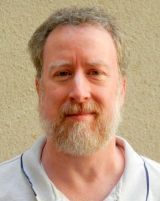 Also note that electronic items such as ebooks and streaming videos often do not have call numbers assigned (this is dependent on the quality of the incoming records), so they may or may not show up in a call number search, thus a different linking method would be more useful for eBooks or other electronic resources. NOTE that record sets are static (in that new items will not appear) However, they can be affected by deletions, so that a record that is removed from the system will also be unlinked and removed from a record set). Therefore, this linking method (and linking to a record set by name) is probably only useful on a temporary basis (i.e., if you are manually gathering a number of items with differing collections or formats for a course with a specific end date), or for a display. This is functionally the same as the section above by record set number. Where bibrecordsetname is the name of the record set, and needs to be enclosed in quotes.